Universal Pictures and Flicker Alley present Universal Pictures’ new 4K restoration of the 1929 silent classic, The Last Warning, accompanied by a newly recorded score from Arthur Barrow. Adapted from Thomas F. Fallon’s 1922 Broadway play of the same name, The Last Warning is based on the story The House of Fear by Wadsworth Camp and centers on an unsolved murder that occurs during a live Broadway performance. When the victim’s body goes missing, the death remains unsolved and the theater is condemned. That is, until years later when a suspicious new “producer” arrives to restage the play with the original cast and crew. 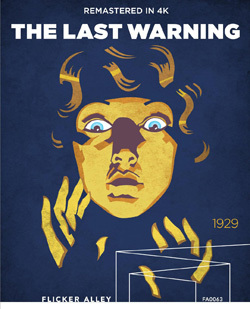 As one of the last silent Universal produced, The Last Warning was later released as a “part-talkie” with roughly sixty feet of sound scenes added. The Last Warning was Paul Leni's final film before his untimely death, and a prime showcase for Universal's leading lady of the era, Laura La Plante. A visual artist at the peak of his career, Leni’s camera never stops shifting, offering cutaways and trick shots involving nervous could-be culprits, a highly suspicious sleuth, and cast members who suddenly disappear in the darkened theater. The result is a cinematic funhouse that restlessly crossexamines the suspense of the story’s stage play against the “real” murder mystery saga, all unfolding amid the outstanding production design of Charles D. Hall. Paul Leni and The Last Warning: A visual essay by film historian and author, John Soister on Leni’s final film. Rare Image Gallery: A slide show presentation of vintage marketing materials and production stills. “Of Gods and Monsters”: An essay excerpt from the book of the same name by historian John Soister. “Notes On the New Score”: A short essay by composer Arthur Barrow on his new score for The Last Warning.